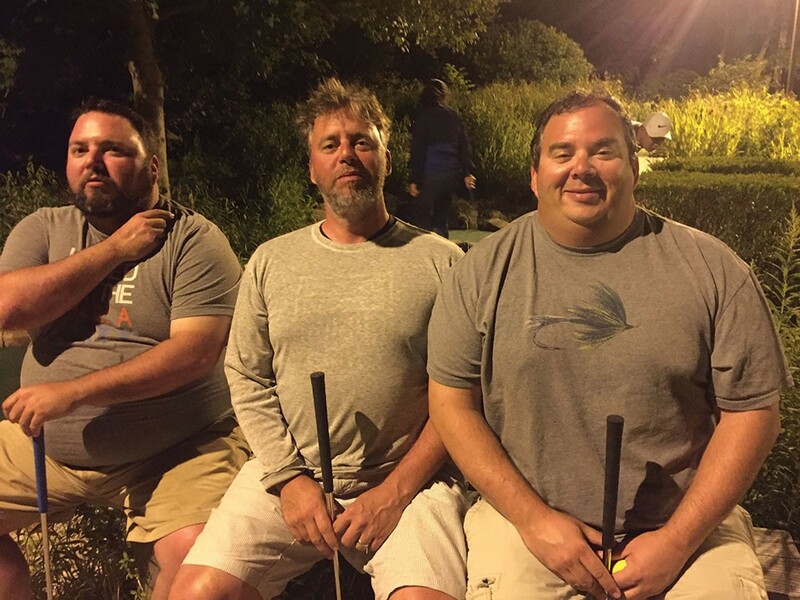 The brothers Mahoney at Harbor Lights Mini-Golf in Brewster, MA, on August 16. Twenty years ago, I wrote a piece for this magazine titled "Summer of `83," for the July, 1997 issue. It ostensibly told the story of a 12-year-old on holiday with his family on Cape Cod. This preteen is far from his friends, responsibility-free, and needs to find ways to entertain himself in the expansive stretches of time that are his summer days. He's pimply and shy. He's a bed wetter and a reformed pyromaniac. He's got a crush on a girl, a family friend, who's staying with them; he's as useless at figuring out what to do with this infatuation as you would expect of most 12-year-old boys. As a kind of reaction to all of this, the lad becomes obsessed with miniature golf and spends an inordinate amount of time at a miniature golf course within a bike ride of his family's vacation rental. He plays the course over and over, a dozen times a day, which the kindly owner allows, charging him just the price of one game. By the end of the three-week holiday, he's gotten a hole-in-one on every hole, even the seemingly impossible hole 16, which is a raised mound that slopes away on all sides from the cup in the middle. He rides away on that final day in a state of deflated satisfaction. Something (inconsequential) was accomplished, but no one saw it and nothing changed. The piece ends with a quote from a poem by Czeslaw Milosz: "To win? To lose? What for, if the world will forget us anyway." It's odd as hell to look back at the carefree kid who spent the summer of `83 doing mostly nothing and playing mini-golf. I know he was me, yet he seems like a distant relative. And then to look at the 26-year-old boy/man, then just starting out as a writer, who decided to document this episode. What prompted me to home in on that experience, as opposed to any other on that vacation, like the day I fell asleep at the beach and got the worst sunburn of my life and my father put me in a cold shower and rubbed popsicles on my back until I stopped crying? Or any other incident whatsoever? But I see that I'm doing it again. Just like at 26, when I looked back at my 12-year-old self and tried to figure out what he was doing, I'm now a 46-year-old interrogating myself 20 years ago. As if, by excavating the past, I could unravel past motivations and thereby understand what I should do now, or next week, or next year. Because like the rest of us, I'm just making it up as I go along. As I can't see the future, the only option is to learn from the past. Of course, looking back is a trap if we merely repeat our past behavior. These memories and associations were swirling in my mental ether last month, when I returned to the Cape with my siblings and their families and our mom. We rented a house in the village of Brewster, on the bay side of the Cape, not far from the house we use to rent back in the early `80s. From the deck of the house, we could see the bay, known as the Brewster Flats, where the tide goes out over a mile twice a day. It's the widest expanse of tidal flats in the Northern Hemisphere. We rented the house for a week, unlike the three weeks my parents vacationed for back in the day. Which got me to thinking: Who goes away for three straight weeks anymore? (The last time I did was 1998. It seems inconceivable now.) As it was, I spent a couple of hours each day on my computer and phone, pushing various projects along and preventing hundreds of e-mails from backing up. I even had a conference call while walking out among the crabs in the tidal pools along with my sister, her husband, and their baby girl, Adeline. I also managed to get radioactively tan (in the best possible way), my small portion of southern Italian DNA showing through. As for mini-golf: I played a round at the old course—still in business 34 years later—with my brothers and brother-in-law the day before we left our beach idyll. I didn't get a single hole-in-one, but my putting was good enough to win by three strokes. (My victory has been marred, however, by accusations of scorekeeping anomalies and doping allegations due to a multiple-margarita-fueled euphoria. I maintain my innocence. We are awaiting a ruling from the World MiniGolf Federation.) I didn't conquer the course this time, but I beat the rest of the family, which was more than enough to delight the 12-year-old boy in me.